Investor sentiment is a useful gauge of potential market direction, but not the way many investors believe. As a child, I vividly remember the cliff divers in Acapulco who had to time their dives from high on a cliff into a narrow inlet with each wave. If they jumped when the water covered the rocks, the wave would recede before they landed, and they would be smashed on the rocks below. They had to jump while the rocks were showing, having faith that a few seconds later a wave would be there to cover the rocks. Talk about courage! Similarly, the financial markets are merely an ebb and flow of the balance between buyers and sellers. The flow is often counterintuitive, like jumping when you see rocks, but really it is more like not watching the hand the magician wants you to see—and watching what else is happening instead. It may seem odd to look at financial markets as sentimental, but investor sentiment indicators are a useful gauge of the possible future direction of a market. True, no one knows exactly what the market will do on any particular day. Short-term events are often driven by the daily news and frequently make no sense at all. Over the long term, however, supply and demand—the balance in the numbers of buyers and sellers at any one point in time—drive markets. When this relationship is in balance, prices will be stable. When buyers outnumber sellers, prices rise. When sellers outnumber buyers, prices decline. Sentiment indicators report the sentiment of different groups of market players such as investors, money managers, or newsletter writers. When sentiment comes into play, it can often seem backward, like so many things in this business do. What’s more important than the actual sentiment numbers reported is the potential for change represented by the numbers. Bullish people invest their money because they believe the market is strong. 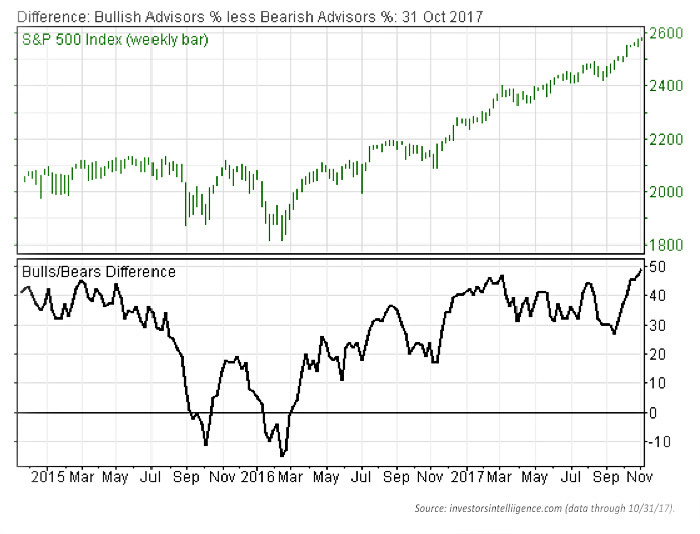 Reports that the numbers of bullish investors or managers have risen sound encouraging on the surface. But let’s analyze what is really happening. The number of investors who “like the market” is high. Normally those same investors, if they like the market, will have put their money where their mouth is and are invested. So far this makes sense. But, bullish sentiment numbers are often telling us that it is time to sell, not buy as you might think, because the number of people who have already invested their money has risen. When you think about this, you will realize that those who have invested their money are no longer potential buyers but have now become potential sellers. When the number of potential sellers is greater than the number of potential buyers, a condition is created from which markets move lower. At a point, all that is needed for the market to decline is some of that daily news that can drive prices down for no apparent reason. It also works the other way, when everyone is bearish on the market. This indicates a shortage of potential sellers because everyone has already sold, and there is lots of cash on the sidelines. This often acts like rocket fuel for stock prices when a market turns around and buyers invest their cash. Sentiment indicators are sometimes categorized as “contrary indicators,” implying that the people polled are always wrong, which is far from the truth. Those who use that label just can’t see beyond the surface of the numbers and understand what they mean—or they don’t want you to understand it. This is another face of the Wall Street propaganda machine trying to get you to take the unprofitable side of an investment, so they can make money off you. Don’t fall for it. What happened yesterday in the stock market won’t make you any money. What will happen tomorrow is what counts. So, to keep our eye on the ball, we must not focus on the numbers of buyers and sellers yesterday. We will do much better if we look at what the numbers of potential buyers and sellers are telling us is more likely to happen tomorrow. Sentiment indicators are only one investment tool. Just like a mechanic will have more than one tool in their bag, so do wise money managers and investors. 1. 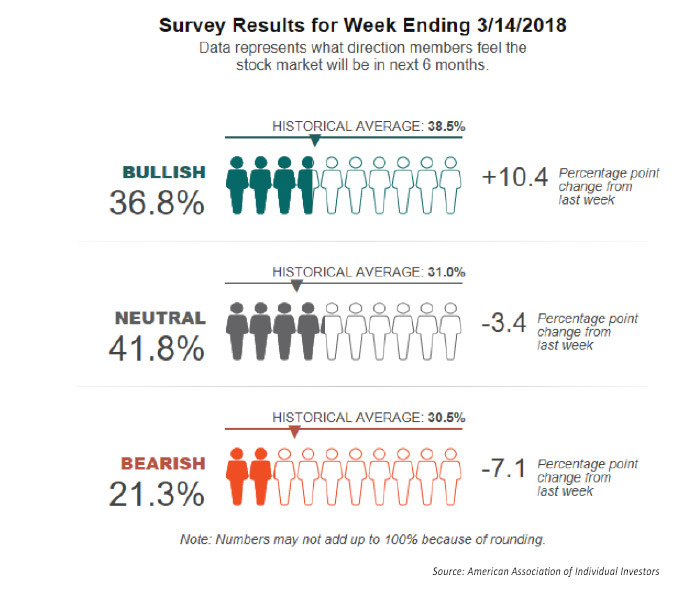 The American Association of Individual Investors (AAII) Sentiment Survey (aaii.com/sentimentsurvey) measures and tracks the “market mood” of individual investors on a trend basis. The weekly survey results are published in­ financial publications, including Barron’s and Bloomberg, and “are widely followed by market strategists, investment newsletter writers, and other financial professionals,” according to AAII. 2. The Advisors Sentiment Report from Investors Intelligence employs a method that studies over a hundred independent market newsletters and assesses each author’s current stance on the market—bullish, bearish, or correction—and then combines and tracks the data. The Investors Intelligence website also provides other market-trend analytical reporting for subscribers. 3. 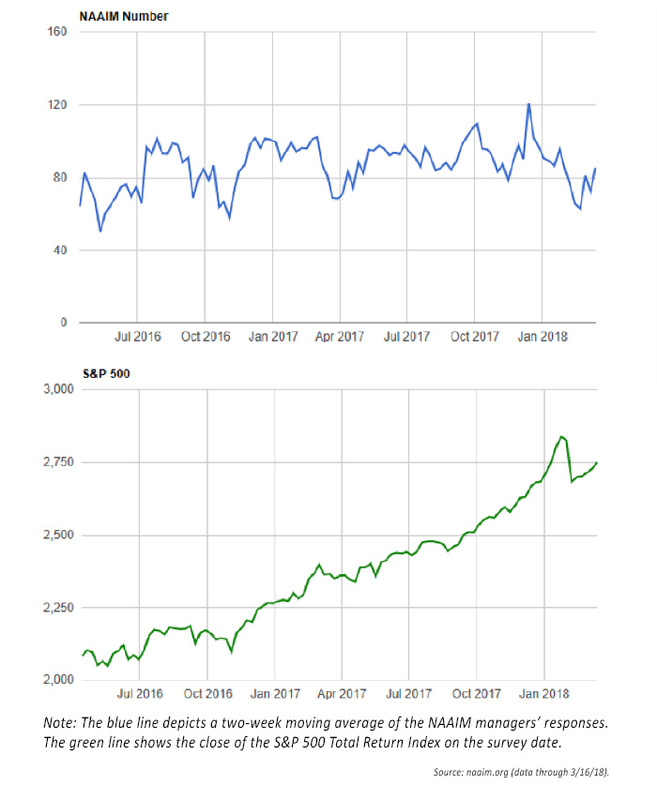 The NAAIM Exposure Index tracks active investment manager sentiment and can be found at the National Association of Active Investment Managers (NAAIM) website (naaim.org/programs/naaim-exposure-index/). 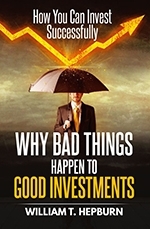 This article is an edited extract from “Why Bad Things Happen to Good Investments” by Will Hepburn with additional content regarding specific sentiment surveys. Mr. Hepburn’s book may be purchased at Amazon.